The Swedish Vallhund is a medium-sized, robust little herding dog that hails from Scandinavia. 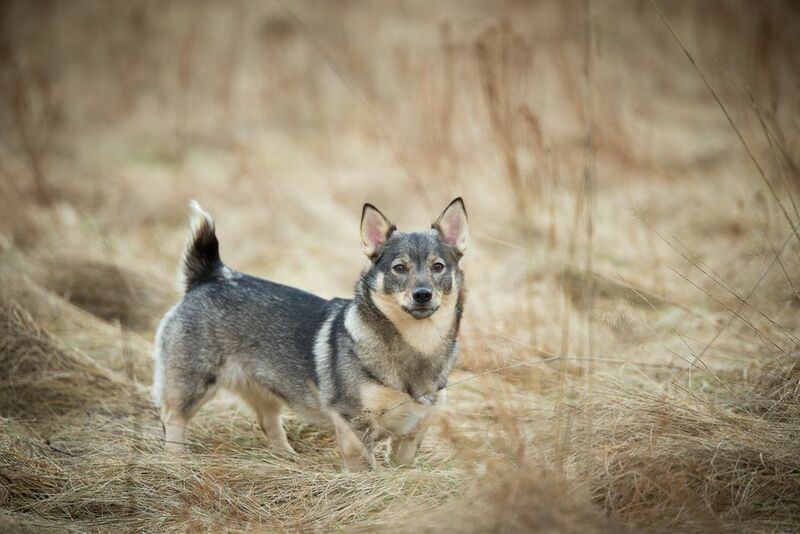 The Swedish Vallhund’s short stature makes it an excellent cattle herder, as they are just the right size to nip at the heels of livestock to move them along, and balanced and agile enough to avoid kicking hooves. At first glance the Swedish Vallhund might seem small with its short legs, but it has the body of a larger dog: sturdy, muscular, and substantial. Swedish Vallhunds may be born with three types of tails: a natural bobtail (no tail), a stub tail, or a long, full tail. The sable coat is comprised of two types of hair: a medium-length, harsh textured outercoat and a softer, dense undercoat. The hair on the head and on the lower legs is shorter; the coat is slightly longer on the neck, chest, and back of the thighs. Swedish Vallhunds are friendly, fearless, engaging little companions with energy to spare. They are happiest when they have a job to do, whether that is herding or working on a farm, competing in a performance sport, or accompanying you everywhere you go. Swedish Vallhunds generally get along well with people, including gentle and respectful kids, as well as most other pets. Many Swedish Vallhunds have a tendency to “herd” family pets and kids with nips and nudges, so training to discourage this behavior is recommended. Swedish Vallhunds are known barkers, which makes them excellent watchdogs, but excessive barking might be problematic in urban settings. The Swedish Vallhund is an ancient breed that has been used for herding cattle in Sweden for hundreds of years. Although it’s a part of the American Kennel Club Herding Group, the Swedish Vallhund is not a shepherd or collie. The Swedish Vallhund is a spitz breed (sometimes called Northern breed)—a type of dog known for its characteristic wolf-like appearance, with a wedge-shaped head, upright ears, and double coat. Not much is known about the true origins of the Swedish Vallhund, but the breed is thought by some to have developed from the mixing of Scandinavian spit-type dogs and the short-legged Corgis of the British Isles. Like most herding breeds, the Swedish Vallhund has a ton of energy. After all, they were bred to work on farms all day herding cattle. Providing enough daily exercise and mental stimulation is key to keeping a Swedish Vallhund happy and well behaved. Some good activities for Swedish Vallhunds include walking, hiking, agility, fetch, obedience, tracking, herding and trieball (a simulated herding activity using inflatable balls). The old adage “a tired dog is a good dog” holds very true for the Swedish Vallhund. Swedish Vallhunds want to please their human companions. They are extremely intelligent and highly trainable. A Swedish Vallhund will eagerly learn as many tricks and commands as you wish to teach him. They respond best to positive-based training methods like clicker training, which uses treats, play, or praise as rewards. Punishment-based methods won’t get you far with the Swedish Vallhund. A breed that was developed to herd cattle won’t be bullied into doing something they don’t want to do. The small but mighty Swedish Vallhund can be strong willed, so keep training fun and upbeat for the best results. Swedish Vallhunds are wash and wear. A good brush out once a week and the occasional bath will keep the coat looking, smelling, and feeling great. Trim the nails every other week, inspect the ears and clean as needed, brush their teeth daily, and your Swedish Vallhund will sparkle. Swedish Vallhunds shed moderately most of the time, with a twice annual heavier shed of the undercoat (called blowing the coat). During the bi-annual heavy shed, brush and bathe more frequently to help remove the shedding undercoat. Swedish Vallhunds are generally healthy. Like all purebred dogs, they can be prone to certain genetic disorders, including hip dysplasia and Swedish Vallhund retinopathy (a degenerative eye disease that results in vision loss and even blindness). Responsible breeders screen their dogs for these issues to avoid breeding affected dogs. The Swedish Vallhund has a relatively large body in proportion to its short legs. It’s important to keep them lean to avoid placing too much stress on the joints. Feed your Swedish Vallhund measured meals at scheduled times (morning and night). Leaving food out all day (sometimes called free feeding) can lead to an overweight dog, which can contribute to health issues like hip dysplasia and diabetes. If you’re not sure how much you should be feeding your Swedish Vallhund, work with your veterinarian to determine your dog’s ideal weight and how much food to feed daily. If you’re unsure if the Swedish Vallhund is the right dog for you, reach out to Swedish Vallhund breeders and owners to ask questions and learn more about life with the breed. The Swedish Vallhund is a relatively rare breed, so it might be hard to find one. The best way to locate a Swedish Vallhund breeder is to contact the Swedish Vallhund Club of America, which is the national club for the breed. The club maintains a list of breeders here. Otherwise, check out all of our other dog breed articles to help you find the perfect dog for you and your family.